Kalaallisut or, in English, Greenlandic, is the standard dialect and official language of Greenland. This standard national language is now taught to all Greenlanders in school, regardless of their native dialect. It is related to Inuktitut. It reflects almost exclusively the language of western Greenland and has borrowed a great deal of vocabulary from Danish, while Canadian and Alaskan Inuit languages have tended to take words from English or sometimes French and Russian. It is written using the Roman alphabet. The dialect of the Upernavik area in northwest Greenland is somewhat different in sound from the standard dialect. 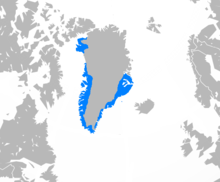 Tunumiit oraasiat, (or Tunumiisut in Kalaallisut, often East Greenlandic in other languages), is the dialect of eastern Greenland. It differs sharply from other Inuit language variants and has roughly 3,000 speakers. Avanersuaq is the dialect of the area around Qaanaaq in northern Greenland. It is sometimes called the Thule dialect or North Greenlandic. This area is the northernmost settlement area of the Inuit and has a relatively small number of speakers. It is reputed to be fairly close to the North Baffin dialect, since a group of Inuit from Baffin Island settled in the area during the 19th and early 20th centuries. It counts under 1,000 speakers. This page was last changed on 23 October 2018, at 18:09.